Reading and share top 22 famous quotes and sayings about Job Opportunities by famous authors and people. Browse top 22 famous quotes and sayings about Job Opportunities by most favorite authors. 1. "We need to focus on green jobs: solar, wind, geothermal, biomass.There's so many opportunities. But other countries like China are getting ahead of the curve." 2. "I found my first novel difficult. I don't want to make it sound like it's any more difficult than driving a cab or going to any other job, but there are so many opportunities for self-doubt, that you just kind of need to soldier on." 3. "Become more valuable to your marketplace at your job. Your job is full of opportunities. Find them! Make more money!" 4. "I hope you're enjoying it, though, duck, and not wasting all your time and energy in a thankless job. You've got to make the most of life and not let these little opportunities pass you by. Before you know it you'll be old and wrinkly like me and wishing you'd done more. Just make sure you're happy." 5. "If I'd had a good week—a real "Christian" week"—I felt close to God. When Sunday came around, I would feel like lifting my head and hands in worship, almost as if to say, "God, here I am . . . I know You're excited about seeing me this week." If I'd had a stellar week, I loved being in God's presence and was sure God was pretty stoked about having me there too. But the opposite was also true. If I hadn't done a good job at being a real Christian, I felt pretty distant from God. If I'd fallen to some temptations, been a jerk to my wife, dodged some easy opportunities to share Christ, was stingy with my money, forgotten to recycle, kicked the dog, etc. . . . well, on those weeks I felt like God wanted nothing to do with me. When I came to church, I had no desire to lift my soul up to God. I was pretty sure He didn't want to see me either. I could feel His displeasure—His lack of approval. That's because I didn't really understand the gospel. Or, at least I had forgotten it." 6. "If we're going to create the best business climate to create higher paying jobs and retain our young people, we're going to have to build a workforce prepared for the opportunities of the future." 7. "When you keep your day job, all opportunities become surplus propositions rather than deficit remedies. You only have to take the ones that suit your dream best." 8. "My job as a leader is to make sure everybody in the company has great opportunities, and that they feel they're having a meaningful impact and are contributing to the good of society. As a world, we're doing a better job of that. 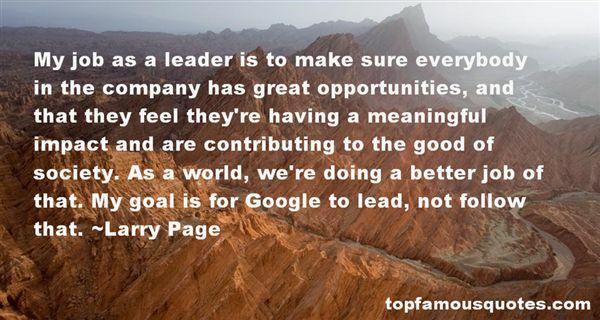 My goal is for Google to lead, not follow that." 9. "We don't do focus groups—that is the job of the designer," said Jony. "It's unfair to ask people who don't have a sense of the opportunities of tomorrow from the context of today to design. "12"
10. "Beyond the queues, the vacancy screens listed jobs in a multitude of languages. Invariably, they were low-paid and short-term dead-ends. Nearby, people in headphones sat at a bank of machines: the blind and the illiterate force-fed with ‘opportunities' by soothing machine voices. On the far wall, in large print, a poster declared: BEGGARS CANNOT BE CHOOSERS." 11. "Let's focus on how we can take someone who is being poorly educated in an American public school and how they are poorly trained for a job, and put in place those opportunities for them to get that education, give their parents choice in education, make it real for them." 12. "I was all-state in four sports in New Jersey, but sometimes I couldn't get served at a restaurant two blocks from my high school. There were no job opportunities then... the only thing a black youth could aspire to be was a bellboy or a pullman or an elevator operator, or, maybe, a teacher. There was a time when all we had was black baseball." 13. "Growing up in Texas, you were either pretty or smart. 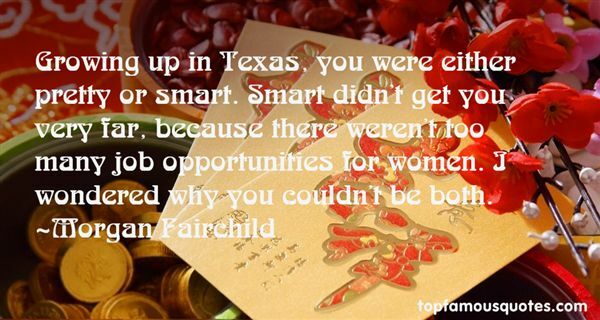 Smart didn't get you very far, because there weren't too many job opportunities for women. I wondered why you couldn't be both." 14. "I loved getting my M. B. A., and I really enjoyed being an accountant and financial analyst before I quit my day job twenty-five years ago to write full time. I just liked writing more…plus, I knew even then that as a full-time writer, I'd get plenty of chances to do business-type stuff, while as an accountant, I probably wouldn't get a lot of opportunities to write about dragons." 15. "We believe a renewed commitment to limited government will unshackle our economy and create millions of new jobs and opportunities for all people, of every background, to succeed and prosper. Under this approach, the spirit of initiative - not political clout - determines who succeeds." 16. "Every day, President Obama and Senator McCaskill are making it harder for working mothers and women of all ages to find a good-paying job. They continue to dictate to our families how they should live, stripping them of opportunities and freedom." 17. "Because of our youthful population, we suffer from unemployment in Iran. We need more universities and more job opportunities for the young." 18. "When I first took this job at the factory it was not my intention to work there very long, for I once possessed higher hopes for my life, although the exact nature of these hopes remained rather vague in my youthful mind. While the work was not arduous, and my fellow workers congenial enough, I did not imagine myself standing forever at my designated assembly block, fitting together pieces of metal into other pieces of metal, with a few interruptions throughout that day for breaks that were supposed to refresh our minds from the tedium of our work or for meal breaks to allow us to nourish our bodies. Somehow it never occurred to me that the nearby town where I and the others at the factory lived, travelling to and from our jobs along the same fog-strewn road, held no higher opportunities for me or anyone else, which no doubt accounts for the vagueness, the wispy insubstantiality, of my youthful hopes." 19. "I do feel we can create more jobs and opportunities for Jersey City residents, but in the spirit of free enterprise, I do not think it is right to force companies to hire a fixed percentage of local residents." 20. "The Apple Marketing Philosophy" that stressed three points. The first was empathy, an intimate connection with the feelings of the customer: "We will truly understand their needs better than any other company." The second was focus: "In order to do a good job of those things that we decide to do, we must eliminate all of the unimportant opportunities." The third and equally important principle, awkwardly named, was impute. It emphasized that people form an opinion about a company or product based on the signals that it conveys. "People DO judge a book by its cover," he wrote. "We may have the best product, the highest quality, the most useful software etc. ; if we present them in a slipshod manner, they will be perceived as slipshod; if we present them in a creative, professional manner, we will impute the desired qualities." 21. "Gratitude can transform common days into thanksgivings, turn routine jobs into joy, and change ordinary opportunities into blessings." —"
22. 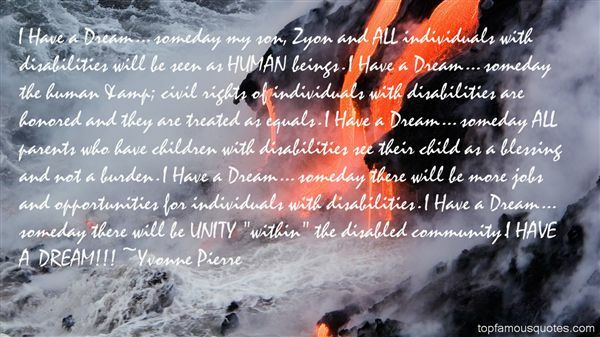 "I Have a Dream... someday my son, Zyon and ALL individuals with disabilities will be seen as HUMAN beings. I Have a Dream... someday the human & civil rights of individuals with disabilities are honored and they are treated as equals. I Have a Dream... someday ALL parents who have children with disabilities see their child as a blessing and not a burden. I Have a Dream... someday there will be more jobs and opportunities for individuals with disabilities. I Have a Dream... someday there will be UNITY "within" the disabled community.I HAVE A DREAM!!!" Ein geistreicher Mensch hat, in gänzlicher Einsamkeit, an seinen eigenen Gedanken und Phantasien vortreffliche Unterhaltung, während von einem Stumpfen die fortwährende Abwechslung von Gesellschaften, Schauspielen, Ausfahrten und Lustbarkeiten, die marternde Langeweile nicht abzuwenden vermag."